ISLAMABAD: Senior leadership of Pakistan Muslim League-Nawaz (PML-N), Pakistan People’s Party (PPP), Muttahida Majlis-e-Amal (MMA) and Awami National Party in a meeting here on Monday decided to form a joint strategy as a grand coalition and protest inside and outside the parliament against rigging in the election. Addressing a joint press conference after the meeting, they condemned the rigging of election and demanded that chief election commissioner and other members should resign for their failure to hold free and fair election. Maulana Fazlur Rehman, Shehbaz Sharif, Syed Yousuf Raza Gilani, Shahid Khaqan Abbasi, Sardar Ayaz Sadiq, Raja Pervaiz Ashraf, Ghulam Ahmed Bilour, Saad Rafique, Amir Muqam, Abdul Qadir Baloch, Marriyum Aurangzeb, Sherry Rehman, Khursheed Ahmed Shah, Nuzhat Sadiq, Naveed Qamar, Raja Pervaiz Ashraf, Farhatullah Babar, Ahsan Iqbal and Balighur Rehman attended the meeting. They discussed the prevailing political situation in the country and the way forward over irregularities in the election and decided to issue a white paper about it. The parties also agreed to hold another All Parties Conference (APC) soon to discuss issues related to the formation of the next government. Yusuf Raza Gilani condemned the censorship of media and interference in the recently held election. He said it has been decided that the agitating parties will “form a strong opposition both inside and outside parliament”. The parties also reiterated claims that the recently-held elections were massively rigged. Gilani denounced the interference of “non-state elements” and also criticised the alleged self-imposed censorship by media houses while reporting election-related protests. The leaders agreed that such kind of rigged election was never held in the history of Pakistan. Speaking on the occasion, Maulana Fazlur Rehman said that the nation should note that the major parties had rejected the election. A delegation of PPP also met National Party leader Hasil Khan Bizenjo to share notes on the political situation. In a media talk, Hasil Bizenjo stated that political parties will have to move ahead with a political attitude and become part of the parliament. 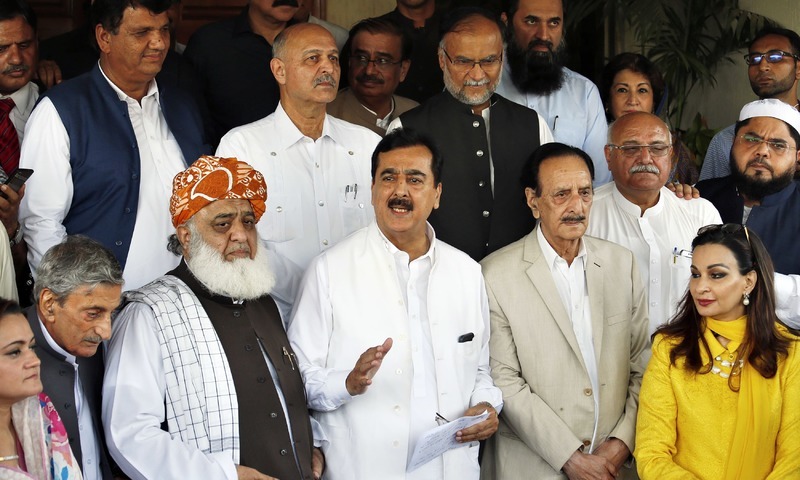 Meanwhile, the PML-N and Jamaat-e-Islami (JI) have decided not to endorse Muttahida Majlis-e-Amal (MMA) President Fazlur Rehman’s suggestion to boycott oath taking of the new parliament, leaving the beleaguered Jamiat Ulema-e-Islam chief in a lurch. According to reports, Fazlur Rehman called on PML-N President Shehbaz Sharif at the Ministers’ Enclave where they exchanged views on various political issues. Rehman was reportedly informed that the PML-N will not boycott the parliament, as proposed by the MMA in the multi-party moot on Friday. Siraj also called for the setting up a commission to probe the allegations of irregularities and rigging in the elections. He stressed that all the affected parties must be allowed to present their reservations which should be removed. He claimed that the illegal interference by the state institutions in the election left a bad impression on the public mind due to which even the winners felt ashamed. Siraj went on to say that the state institutions and their resources were used to change the loyalties of people in order to secure desired results, which was something unprecedented. Besides that, he said that the election results were delayed for hours and the polling agents of the candidates from Dir to Chitral were not provided Form 45. The JI chief, however, expressed satisfaction over the holding of elections on schedule and noted that the religious parties, including the Muttahida Majlis-e-Amal (MMA) had secured more than 5.5 million votes. Sirajul Haq said the JI would play the role of a constructive opposition, appreciate every good work of the government and oppose every wrong move. “We want Imran Khan to fulfil his promises to move the country towards an Islamic state which would require the elimination of interest and the implementation on the decisions of the Council of Islamic Ideology,” he added. Imran Khan has also promised provision of jobs to ten million youth and freeing the country from the hold of the IMF, besides provision of shelter to five million homeless families, he noted. The JI chief maintained that trade with India without the liberation of Kashmir would be harmful to the country. He added that talks with India without Kashmiris leadership would be unproductive. JI Secretary General Liaqat Baloch, JI deputy chiefs Asadullah Bhutto, Dr Farid Ahmed Piracha and other JI office bearers were also present on the occasion.